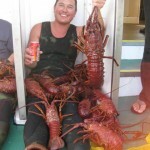 Head out to Cortes Bank for lobster on the opening weekend of the season. About a 100 miles of shore of Southern California, fall is the best time of year to get to this incredible offshore oasis. We have chartered the Vision, flagship of the Truth Aquatics fleet since 1985, that’s over 30 years of experience saying it’s the best way to access California’s Channel Islands. 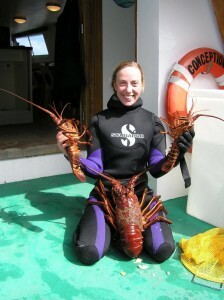 The goal is to stuff our catch bags full of big, California spiny lobster. Schools of yellowtail cruise the drop offs, if you’ve got your fill of the bugs or just want the challenge of catching one of these powerful (and tasty!) fish. This four day trip leaves from Santa Barbara Harbor at 9 pm on Saturday and returns on Wednesday about 5 pm. In between dives you’ll keep you energy up with big, gourmet meals prepared by the galley chefs. Get you fishing license, lobster card, and last minute gear at the Sea Landing Dive Center , located within steps from the Truth Aquatic vessels for convenient equipment rental (tanks and weights are not provided on-board). 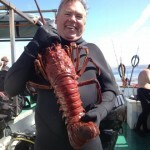 See more details “Preparing for your Channel Islands Trip” on our Currents page. Diving: Individual divers are responsible for their bottom times, profiles, navigation and overall safety. A dive site briefing will be provided before each new dive site. 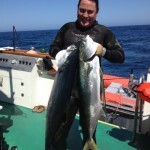 If you would like, dive guides can be made available at $75 per dive. The majority of the diving is done during the day. Night dives will be available, weather dependent. Weather Policy: No refunds will be issued if Cortes Bank is inaccessible due to inclement weather.